Talk with us about a custom class for at least three participants! Watch for Seminars and Classes scheduled for 2014 coming soon! 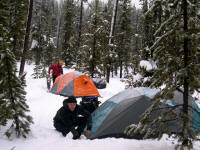 Wednesday, March 6, 2013, from 6 to 8 pm, FREE: "Be Prepared for Spring Backcountry Adventures", at Bend Public Library. NO RESERVATIONS REQUIRED! Everyone knows to "Be Prepared"! Exactly how do you do this? 1. We will show-and-tell essential clothing layers and simple gear chosen by you from the Ten Essential Systems and stuffed in a day pack. We will have some fun and learn some new facts. You will learn skills and concepts to better plan and prepare for the almost inevitable backcountry emergency and possible stranding for yourself or someone else. (This is not a Survivalist talk). This FREE two hour evening includes an eleven page free handout and a short list of recommended reading, free from the public library shelves. 2. The basic use together, of an $8. USGS topo map, a simple $25. Suunto M3D adjustable declination base plate compass and a fast and super accurate $100. Garmin eTrex Venture HC GPS, will be explained. 3. Note that a Search and Rescue is not initiated until a call is made to 911. Ordinary digital cell phones and basic skills can take the ‘Search’ out of Search and Rescue! However, certain Cell Providers do not service the backcountry of Central Oregon! You do not need a costly ‘GPS’ or ‘navigation app’ in your phone! You will learn how the FCC E911 cell phone system locator works and how to call for FREE help from your friends or Deschutes County SAR Volunteers. Some folks may consider owning a $100. ‘SPOT-2 Satellite Messenger’. This class is best for adults who like to hike, climb, hunt, ski, snowshoe, snowmobile, photo shoot or explore in all four Seasons in the high desert backcountry and high Wilderness areas of Central Oregon. –Robert Speik, www.TraditionalMountaineering.org, 541-385-0445, from 9 to 5! Wednesday, May 1, 2013, from 6 to 8 pm, FREE: "Exactly how can I personally 'Be Prepared' for seasonal Backcountry adventures? ", at Bend Public Library. Exactly how can I meet Legal and Traditional requirements and Be Personally Prepared for seasonal Backcountry adventures? Major Outings Clubs nationwide, follow a general format of classes to permit their Members to enjoy together, Backcountry adventures from evening hikes to all day epics into the high country to snowshoe adventures to Shelters in the winter. 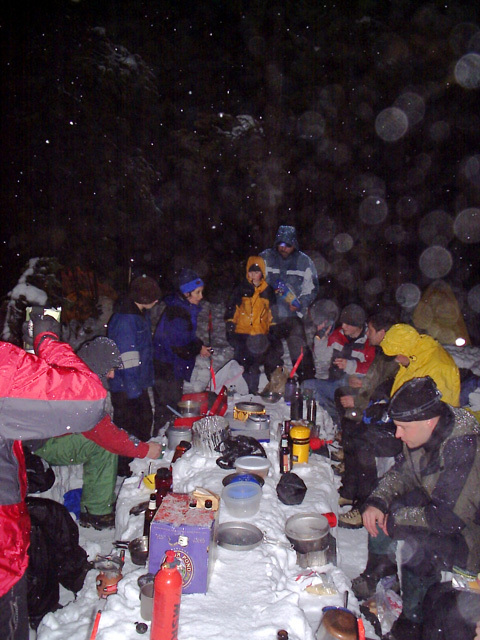 These 'Club' classes focus on a few traditional (and legal) Responsibilities and on The Seattle Mountaineers' list of Ten Essential Systems: seasonal and weather and trip dependant personal items needed to stay out overnight due to having lost the way, injury to self, friends or strangers, bad weather or dark of night. Essential items are required to be carried in a light day pack by each participant, on traditional Club outings. Many items are required by current Oregon Statute, to avoid up to $500.00 possible per-person reimbursement, charged at the discretion of County Rescue Units. We promise an interesting evening with a short PowerPoint presentation, your detailed questions and the show and tell of the actual 'Light and Fast, Fit and Experienced' personal gear, stuffed loose in Spring and Summer demonstration day packs, selected for two seasons and several varied adventures. Of course, we will have multi page handouts with seasonal gear options by weight and utility, updated from my COCC Extension classes back in the day. "New to mountaineering? Or, do you want to improve your skills before climbing in the Sierras, Cascades or Rockies? Whatever your climbing level, Mountain Link has developed the seminar to help you get to your next step. This two day course is designed to enlighten and train you to feel comfortable to climb on your own with out having to be guided." "My name is Robert Link and I will be instructing the seminars. I was one of Ed Viesturs climbing partners on his first three 8 thousand meter peaks. We were also two of the first mountaineers to successfully guide Everest twenty years ago. I invite you to come and enjoy the mountains, hear some stories and maybe learn a thing or two." Group gear: tents, ropes, anchors and kitchen will be provided. You will need to bring snacks, dinner and breakfast. If you have any of this gear feel free to bring it. Cost: $ 200/person, payment method, PayPal check or cash 8 spaces per trip. "How to work in the backcountry with the right map and compass and an optional simple GPS"
We will show-and-tell about USGS Quad maps ($8) and affordable Garmin map computer programs ($99), that help you print your own small maps. Free Forest Service maps at Trail Heads have UTM Grid lines and give you important locations in UTM NAD27 coordinates. How do you use these maps and grids? If you do not have the right map, you will be unable to use it well with your compass or your GPS! Handouts include a topo map, a workbook and a printed summary. Then, with the workbook, we will work in pairs and threes on drills and real life situations. I can provide the right maps; you can try your own compass and GPS or try ours. Call Robert at 541-385-0445, for information about this training near Sisters. You just can’t stay found with GPS alone! You need the right map and a compass too. But how do you use them together, for a day hike, a backpack, a hunt or a mountain bike adventure? We will learn about USGS Quad maps ($8) and affordable TOPO map computer programs ($99) that help you print your own small maps. Free Forest Service maps at Trail Heads have UTM Grid lines and give you important locations in UTM NAD27 coordinates. How do you use these maps and grids? If you do not have the right map, you will be unable to use it with your compass or GPS. We will learn about how to use a simple declination adjusted base plate Compass, not to just point to North, but to plot a bearing back to car or camp using the compass on the map as a simple protractor. If you do not adjust for our current 16 degrees declination you will be off 1,472 feet in each mile. A simple Garmin eTrex Venture HC GPS ($100) is just as accurate as a GPS costing $950. There are just five basic GPS pages needed to find your way, to find a location on the map and to plot the way back along trails, traces and contours. Those participants with a GPS will learn how to set up their own receiver and use these five pages. If your selected GPS Datum does not match the map, waypoints may be off by 600’. With a five page Workbook, we will work in pairs and threes on drills and real life situations. Handouts include an eleven page printed summary too. We provide the topo maps; you can work with your compass and GPS or try ours. Cost per student is a $35.00 fee benefiting www.TraditionalMountaineering.org. Monday, October 1, 2012, "Exactly how can I personally Be Prepared for seasonal Backcountry adventures?" FULL with 40 confirmed electronic reservations! Major Outings Clubs nationwide, follow a general format of classes to permit their Members to enjoy together, Backcountry adventures from evening hikes to all day epics into the high country, to snowshoe adventures to Shelters in the winter. These Club classes focus on a few traditional (and legal) Responsibilities and on The Seattle Mountaineers list of Ten Essential Systems: seasonal and weather and trip dependant personal items needed to stay out overnight due to having lost the way, injury to self, friends or strangers, bad weather or dark of night. Essential items are required to be carried in a light day pack by each participant, on traditional Club outings. Many items are required by current Oregon Statute, to avoid up to $500.00 possible per-person reimbursement, at the discretion of County Rescue Units. We promise an interesting Meet-up evening with a short PowerPoint presentation, your detailed questions and the show and tell of the actual 'Light and Fast, Fit and Experienced' personal gear, stuffed loose in three demonstration day packs, selected for three seasons and several varied adventures. Of course, we will have multi page handouts with seasonal gear options by weight and utility, updated from my COCC classes back in the day. 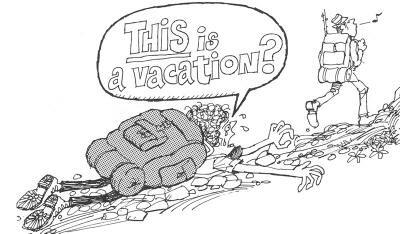 The subject: "Exactly how can I meet Legal and Traditional requirements and Be Prepared for seasonal Backcountry adventures?" becomes more valuable as Fall and Winter require more thoughtful effort. I propose to offer to the Bend Hiking Meetup, a FREE hands-on one and a half-hour class on the subject for up to twenty interested people, at the downtown Bend Deschutes Public Library on Wall Street, at 6 pm on Monday, July 16, 2012. We will show-and-tell about USGS Quad maps ($7) and affordable Garmin map computer programs ($99), that help you print your own small maps. Free Forest Service maps at Trail Heads have UTM Grid lines and give you important locations in UTM NAD27 coordinates. How do you use these maps and grids? If you do not have the right map, you will be unable to use it well with your compass or GPS! Handouts can include a printed summary. Then, with a workbook, we will work in pairs and threes on drills and real life situations. I can provide the right maps; you can try your own compass and GPS or try ours. For 20 pre-registered Members of the Bend Hiking Meetup Group. Call 541-385-0445, for information. For 20 pre-registered Members of the Bend Hiking Meetup Group. The wait list of about 20 more Members may attend the repeat class on Monday, July 16, 2012. Learn more about this traditional navigation instruction. "Find your way back from the Backcountry with Map, Compass and GPS, together"
You just can’t “stay found” with GPS alone! You need the right map and a compass too. But how do you use them together, for a day hike, a backpack, a hunt or a mountain bike adventure? How do you find your way back when blowing snow has covered your tracks. How do you actually use that GPS anyway? We will talk about USGS Quad maps ($7) and affordable TOPO map computer programs ($99), that help you print your own small maps. Free Forest Service maps at Trail Heads have UTM Grid lines and give you important locations in UTM NAD27 coordinates. How do you use these maps and grids? If you do not have the right map, you will be unable to use it with your GPS! We will talk about how to use a simple base plate Compass, not to just point to North, but to plot a bearing back to car or camp using the compass on the map as a simple protractor. If you do not adjust CORRECTLY FOR OUR 16 DEGREE EAST DECLINATION, you will be off point from 1,472 to 2944 feet in each 5,280 foot mile you walk with a compass! A simple Garmin eTrex Venture HC GPS ($99) is just as accurate as a GPS costing $750. There are just five basic pages needed to find your way, to find a location on the map and to plot the way back along trails, traces and contours. Those participants who have a GPS will learn how to use these pages. If your selected GPS Datum does not match your map, waypoints may be off as much as 600 feet! Handouts include an eleven page printed summary. Then, with a five page workbook, we will work in pairs and threes on drills and real life situations. We provide the right maps; you can use your own compass and GPS or try ours. Cost per student is $40.00, benefiting the not-for-profit website www.TraditionalMountaineering.org. Ask about couples discounts, scholarships, etc. In fairness to all, five participants must Reserve a place by February, 2012 or the class may be cancelled! Call us for other dates! For more information and to hold a place, email info@traditionalmountaineering.org or call Robert Speik at 541.385.0445. See the Flyer - decide to print it for a friend. See photos of USFS Volunteer Training. See photos of a recent class! Snow camping from bivy to base camp! Learn and employ skills and gear for safer bivy to base camp fun in deep snow near parked cars and privies! This basic to advanced training can be completed in this interesting FREE overnight seminar. Handouts will include a printed summary of the class information. This is a FREE outdoor, hands-on, interactive skills Seminar with Robert Speik. Reserve your places! We are limiting this class to "10 or so" participants! For more information and to join this free Seminar: email info@traditionalmountaineering.org or call Robert Speik at 541-385-0445. (Check the revised dates in these documents!) Print the flyer for a friend! See the recent Prospectus! See our photos of this Seminar! An indoor, hands-on skills class with Robert Speik: Responsibilities, essentials, clothing, winter risk mitigation, reasonable trip planning with map, compass and optional GPS, snow cave and tent camping, cooking, climbing steep slopes with minimum gear and skills, identification of possible avalanche risk and more. Meet new friends. This class is similar to winter basic mountaineering training provided by many major mountaineering clubs in the United States. Read the Seminar notes and Ice Axe Arrest and roped travel. See the photos of the gear. We are limiting this class to about 10 participants. No drop-ins please! Cost is $20.00. Prepaid Reservations only, by April , 2012! Climbing and descending steep snow slopes, ice axe belay and arrest and rope protected travel! We will meet near the Mt. Bachelor parking lot at about 9 am. From the cars we will take a short walk on consolidated snow to an "appropriate slope" for steep snow climbing skills and ice axe belay/arrest practice, skills needed for summitting Hood, Shasta, Jefferson, Adams, Aconcagua and all the others. Designed for basic to advanced participants. Learn about skills and gear needed for rope protected climbing and rappelling steep snow, rock and ice slopes on major peaks, basic avalanche risk avoidance and crevasse rescue gear and set-up. Learn to use the traditional mountaineering ice axe for self belay and arrest. See the photos of Ice Axe Arrest and Technical Steep Snow Climbing. Participants must have studied the positions and method of instruction for snow climbing and ice axe belay and arrest and be able to describe these skills before practicing each belay or arrest. We are limiting this class to about 10 participants. No drop-ins permitted! Reservations only, by April 20, 2011! Information and permission to participate from Leader Robert Speik at 541-385-0445, info@traditionalmountaineering.org. Note: This is the traditional self belay rappelling method that can be dangerous! Read More here: How can I self belay my rappels? Participate in a FREE Seminar on Basic Rappelling at the crags overlooking the Deschutes River at Meadow Trail Head near Bend, Oregon. Read more here: How can I self belay my rappels? Read the Prospectus and See our photos of our recent rappelling Seminar. You must Reserve by April 27, 2011! Email Basic Rappelling or call Bob Speik at 541-385-0445, for permission to participate and to find the special instructions for the day. A simple Garmin eTrex H GPS ($99) is just as accurate as a GPS costing $750. There are just five basic pages needed to find your way, to find a location on the map and to plot the way back along trails, traces and contours. Those participants who have a GPS will learn how to use these pages. If your selected GPS Datum does not match your map, waypoints may be off as much as 600 feet! Cost per student is $35.00, benefiting the not-for-profit website www.TraditionalMountaineering.org . Ask about couples discounts, scholarships, etc. In fairness to all, five participants must Reserve a place by February 16, 2011 or the class may be cancelled! Call us for other dates! Saturday, April 23, 2011, 9 am to about 3 pm, a Fee Class near downtown Bend OOOPS! - EASTER WEEKEND! CLASS IS CANCELLED! We are limiting this class to about 10 participants. No drop-ins please! Cost is $20.00. Prepaid Reservations only, by April 20, 2011! “BE PREPARED” for your Backcountry Adventures! Everyone knows to "BE PREPARED" but exactly how do you do this? This is not a Survivalist talk. We will have some fun and learn some new stuff. HOW DO YOU FIND YOUR WAY BACK IN UNEXPECTED BLOWING SNOW? "Staying found in the Backcountry with Map, Compass and GPS, together"
We will talk about how to use a simple base plate Compass, not to just point to North, but to plot a bearing back to car or camp using the compass on the map as a simple protractor. If you do not adjust for declination, you will be off 1,472 feet in each mile! Cost per student is $35.00, benefiting the not-for-profit website www.TraditionalMountaineering.org. Ask about couples discounts, scholarships, etc. In fairness to all, you must Reserve a place! HOW DO YOU FIND YOUR WAY BACK IN THE DARK OR UNEXPECTED BLOWING SNOW? We will talk about USGS Quad maps ($7) and affordable TOPO map computer programs ($99), that help you print your own small maps. Free Forest Service maps at Trail Heads have UTM Grid lines and give you important locations in UTM NAD27 coordinates. How do you use these maps and grids? A simple Garmin eTrex H GPS ($99) is just as accurate as a GPS costing $750. There are just five basic pages needed to find your way, to find a location on the map and to plot the way back along trails, traces and contours. Those participants who have a GPS will learn how to use these pages. Our proprietary Power Point program covers all the information. Then, with a five page workbook, we will work in pairs and threes on drills and real life situations. Handouts include an eleven page printed summary too. We provide the maps; you can use your compass and GPS or try ours. In fairness to all, you should Reserve a place! For more information and to hold a place, email info@traditionalmountaineering.org or call Robert Speik at 541.385.0445. Print the flyer for a friend. See photos of a recent class. See photos of USFS Volunteer Training. See last year's class! This FREE talk is offered at the Bend Public Library from 6pm. to 8pm., on a first come first served basis. Please do not call to reserve a place. Best for older teens and for adults who like to hike, hunt, ski, snowshoe and explore in the backcountry. Print the flyer for a friend. FULL with 25 interested adults attending! In a display case near the Information Desk on the second floor of the library, we have disgorged the Essential contents of a sunny weather winter day pack (near Mt. Bachelor) and added the right boots and snowshoes, the right shoes for light and fast spring crampons (Mt Adams), light poles and a modern ice axe, too. Check it out and pick up the latest Green Card that lists the Four Basic Responsibilities and the Ten Essential Systems for a friend. This is a FREE field exercise for folks who have learned a bit about modern land navigation techniques with map, compass and "optional" GPS. Click for Photos of a previous Noodle Jim Witty wrote about a Noodle for The Bulletin. You just can’t “stay found” with GPS alone! You need the right map and a compass too. But how do you use them together, for a day hike, a backpack, a hunt or a mountain bike adventure? How do you find your way back when it is dark or blowing snow has covered your tracks. How do you actually use that GPS anyway? See photos of a recent class. See photos of USFS Volunteer Training. See last year's class! Learn and employ skills and gear for safe bivy to base camp fun in deep snow near parked cars and privies! This basic to advanced training can be completed in this interesting FREE overnight seminar. Handouts will include a printed summary of the class information. This is a FREE outdoor, hands-on, interactive skills Seminar lead by Robert Speik. See the flyer! See the Prospectus! See our photos of this Seminar! BASIC WINTER-SPRING MOUNTAINEERING GREAT SUCCESS, WITH 16 PARTICIPANTS FROM THREE STATES! An indoor, hands-on skills class with Robert Speik: Responsibilities, essentials, clothing, winter-spring risk mitigation, reasonable trip planning with map, compass and optional GPS, snow cave and tent camping, cooking, climbing steep slopes with minimum gear and skills, identification of possible avalanche risk and more. Meet new friends. This class is similar to winter basic mountaineering training provided by many major mountaineering clubs in the United States. Read the Flyer. See the photos of Ice Axe Arrest and of Technical Steep Snow Climbing. We are limiting this class to 10 participants. No drop-ins please! Cost is $25.00. Reservations only, ASAP! Information from Instructor Robert Speik at 541-385-0445, info@traditionalmountaineering.org See the photos of this gear. Climbing and descending steep snow slopes, ice axe belay and arrest and crevasse rescue! GREAT SUCCESS, WITH 17 PARTICIPANTS FROM FOUR STATES! We will meet near the Mt. Bachelor parking lot at about 9AM. From there we will a short hike on consolidated snow to certain appropriate slopes for steep snow climbing skills and ice axe belay/arrest practice, skills needed for Aconcagua, Hood, Shasta, Jefferson, Adams, and all the others. Learn about skills and gear for rope protected climbing and rappelling steep snow, rock and ice slopes on major peaks, avalanche risk avoidance, crevasse rescue gear and set-up. Designed for basic to advanced participants. Read the Prospectus. See the photos of Ice Axe Arrest and of Technical Steep Snow Climbing. See the pictures of this 2008 event! Participants must have the details and method of instruction for snow climbing and Ice axe belay and arrest in mind. In June and July, 2009, most any evening or Saturday, for two or three hours, my place or yours! "Finding your way in the Backcountry using Map, Compass and GPS, together"
You just can’t stay found with GPS alone! You need the right map and a compass too. But how do you use them together, for a day hike, a backpack, a hunt or a mountain bike adventure? How do you find your way back when clouds or dusk obscures the way. How do you actually use that GPS anyway? A simple Garmin eTrex H GPS ($99) is just as accurate as a GPS costing $750 and more. There are just five basic pages needed to find your way, to find a location on the map and to plot the way back along trails, traces and contours. Those participants who have a GPS will learn how to use these pages. With a five page workbook, we will work in pairs and threes on drills and real life situations. Handouts include an eleven page printed summary too. We provide the maps; you can use your compass and GPS or try ours. Minimum of three and maximum of five participants. You must arrange the group and Reserve the time! For more information and to get a class together, email info@traditionalmountaineering.org or call Robert Speik at 541.385.0445. This FREE class with Bob Speik will begin with a hands on talk about how to really "Be Prepared" for adventures into the nearby Cascades. We will show and tell all of the contents of a 24 pound backpack for a summer trip to Moraine Lake, Chambers Lakes, Green Lakes and some lesser know sweet spots in our nearby Wilderness. Seven pages of practical handouts for up to 25 people. Seating first come first served at the door! Read and print the flyer for a friend. This Class includes a 12 page handout covering clothing layers and what light gear to carry into the backcountry of Oregon and how to use your inexpensive GPS to find your exact position with the UTM Grid on free USFS Winter Maps. 104 Participants! Not open to the public. Staying Found in the Backcountry - with Map, Compass and GPS, Together! 20 attended despite the winter storm! You just can’t “stay found” with GPS alone! You need the right map and a compass too. But how do you use them together, for a day hike, a backpack, a hunt or a mountain bike adventure? We will talk about USGS Quad maps ($7) and affordable TOPO map computer programs ($99) that help you print your own small maps. Free Forest Service maps at Trail Heads have UTM Grid lines and give you important locations in UTM NAD27 coordinates. How do you use these maps and grids? Our proprietary Power Point program covers all the information. Then we can demonstrate how to create a map on the screen with National Geographic’s TOPO. Then, with a five page workbook, we will work in pairs and threes on drills and real life situations. Handouts include an eleven page printed summary too. We provide the maps; you can use your compass and GPS or try ours. Cost per student is $35.00, benefiting the not-for-profit website www.TraditionalMountaineering.org. In fairness to all, you must Reserve a place! For more information and to hold a place, email info@traditionalmountaineering.org or call Robert Speik at 541.385.0445. See photos of USFS Volunteer Training. For beginning through advanced adventures. Print the flyer for a friend. See photos of last years class. Every serious outdoor recreationist and outdoor Leader should take this nationally recognized two day Wilderness First Aid (WFA) class. Accidents occurring beyond the planned immediate response time of our national emergency rescue net should be handled with techniques very different from those taught in Red Cross First Aid classes. Wilderness Medical Institute of NOLS is nationally recognized, offering special Certified training for medical professionals and backcountry, climbing and river guide services. Wilderness First Responder (WFR) training by WMI takes two weeks. This WFA class qualifies as a recertification for WFR Certificate holders. Fast paced and a lot of fun, the WFA class includes realistic accident simulations in the outdoors. This two day adventure will be held at a private ranch in Tumalo, near Bend. Some folks may wish to car/tent camp at the ranch and enjoy a community cook-out and bon-fire on Saturday evening. Minimum of 15 and maximum of 30 participants. Fee is $125. These WFA classes usually cost from $135 to $182. You must Reserve before February 8, 2008, and pay the non refundable fee in full as required by WMI. For more information call Robert Speik at 541-385-0445. Note: This great class filled quickly with 30 pre-paid, non refundable registrations. We plan to have the class again on a weekend in early summer. We have a wait list of 9; if you might like to participate, send us an email. See the pictures! Learn and employ skills and gear for safe bivy to base camp fun in deep snow near parked cars and privies! This basic to advanced training can be completed in this interesting FREE overnight seminar. Handouts will include a printed summary of the class information. This is a FREE outdoor, hands-on, interactive skills Seminar lead by Robert Speik. Reserve your places! We are limiting this class to "10 or so" participants! *** In fairness to all, you will need to commit by to be announced, 2008. Read the Prospectus. See the photos of Ice Axe Arrest and of Technical Steep Snow Climbing. We are limiting this class to 10 participants. No drop-ins please! Cost is $20.00. Reservations only, by April 10, 2008! We will meet near the Mt. Bachelor parking lot at about 9AM. From there we will a short hike on consolidated snow to certain appropriate slopes for steep snow climbing skills and ice axe belay/arrest practice, skills needed for Aconcagua, Hood, Shasta, Jefferson, Adams, and all the others. Learn about skills and gear for rope protected climbing and rappelling steep snow, rock and ice slopes on major peaks, avalanche risk avoidance, crevasse rescue gear and set-up. Designed for basic to advanced participants. We are limiting this class to 10 participants. No drop-ins please! Reservations only, by April 10, 2008! Information from Leader Robert Speik at 541-385-0445, info@traditionalmountaineering.org See the photos of this event. We will talk about USGS Quad maps ($7) and affordable TOPO map computer programs ($99), that help you print your own small maps. Free Forest Service maps at Trail Heads have UTM Grid lines and give you important locations in UTM NAD27 coordinates. Your GPS will give an exact position on your map not possible with Lat-Lon grids. How do you use these maps and grids? A simple Garmin eTrex H GPS ($99) is just as accurate as a GPS costing $750. There are just five basic pages needed to find your way, to find a location on the map and to plot the way back along trails, traces and contours. Use our GPS receivers before you buy! Those participants who have a GPS will learn how to use these pages on their own receiver model..
Print the flyer for a friend. See photos of last year's class. See photos of USFS Volunteer Training. See this year's February class! Note: This is the older rappelling method that can be dangerous! Staying Found in the Backcountry - with Map, Compass and GPS, Together! You just can’t “stay found” with GPS alone! You need the right map and a compass too. But how do you use them together, for a day hike, a backpack, a hunt or a mountain bike adventure? Can you find your way in a white out or in a winter snow storm? Our proprietary Power Point program helps cover all the information. Then we will demonstrate how to create a map on the screen with National Geographic’s TOPO and print it on letter sized paper. Then, with a five page workbook, we will work in pairs and threes on drills and real life situations. Handouts include an eleven page printed summary too. We provide the maps; you can use your compass and GPS or try ours. Cost per student is $40.00, benefiting the not-for-profit website www.TraditionalMountaineering.org. Call us about family and student discounts. This is a free class; Reservations are requested! There are 72 seats. In fairness to all, you must Reserve a place! For more information call Bobbie at the Fire District at 541-475-7274. Print the Flyer! This is a repeat of the Class given to 89 people at COCC in December, sponsored by Oregon State Snowmobile Association, Workensport and TraditionalMountaineering.org. This is a free class; Reservations are not required! There are about 60 seats. First come first served! For more information call Bob Speik at 541-385-0445. Print the Flyer! This is a repeat of the Class given at COCC in December. This is the second year for this interesting Training. Classes include: First Aid & CPR, Historic Site Stewardship Program, Map, Compass and GPS, Pacific Crest Trail Adopters & Potential Volunteers, Saw Re-certification, Survival Tips, Trail Bridge Survey, Trail Maintenance Basics, Trail Maintenance Crew Leader Training, Wilderness Stewardship & Trailhead Hosts. The weekend includes camping together with like minded interesting folks, evening BBQs and entertainment and lots of things to learn. Yes, "He who knows naught, know not that he knows naught." I will be participating, learning from others and teaching about 30 folks how to "Stay Found with Map Compass and GPS Together". Call Judy Mitchell at 541-225-6319. We will meet near the Mt. Bachelor parking lot at about 9AM. From there we will hike on consolidated snow to certain appropriate slopes for steep snow climbing skills and ice axe belay/arrest practice, skills needed for Aconcagua, Hood, Shasta, Jefferson, Adams, and all the others. Learn about skills and gear for rope protected climbing and rappelling steep snow, rock and ice slopes on major peaks, avalanche risk avoidance, crevasse rescue gear and set-up. No drop-ins please! Reservations only. Note: This is the older method that can be dangerous! Read the Prospectus. Print the Prospectus for a friend. Near Meadow Trail Head on the Deschutes River just west of Bend. 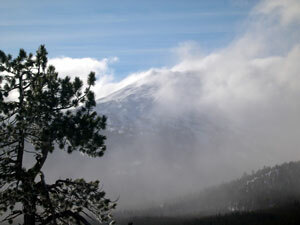 The Meadow Crags Re-bolting Project is hosted by Traditional Mountaineering. Cost per student is $35.00, benefiting the not for profit website www.TraditionalMountaineering.org. Register on the web or at Bend Map and Blueprint on Bond in downtown Bend. In fairness to all, you must Reserve a place! Register by August 22, 2006. See the Flyer and/or Print the flyer for a friend. For more information email info@traditionalmountaineering.org or call Robert Speik at 541.385.0445. See photos of last years class. Bend Map and Blue Print has sponsored this Backcountry Navigation Class at the Environmental Center. They have a complete inventory of USGS Quad Maps. Saturday, September 8, 2007, 9AM to 3PM, FREE Navigation Noodle® in the Badlands, no matter what the weather! This is a FREE field exercise for folks who have learned a bit about modern land navigation techniques with map, compass and "optional" GPS. Click for Photos of a previous Noodle Jim Witty wrote about a Noodle for The Bulletin. Limited to 10 people. You must Reserve a place! Call Bob Speik at 385-0445 for your Reservation, the location of the meeting place and a detailed Prospectus. Saturday, November 17, 2007, 10AM to about 1PM, Staying Found in the Backcountry with Map, Compass and GPS sponsored by Sportsman's Warehouse. Cost per student is FREE, thanks to our sponsor. Register at Sportsman's Warehouse at the north end of Bend. To be sure of a place, you should Reserve! See the Flyer and/or Print the flyer for a friend. For more information email info@traditionalmountaineering.org or call Robert Speik at 541.385.0445. See photos of a recent class. Sportsman's Warehouse is sponsoring this Backcountry Navigation Class at their store on the North end of Bend. They have a complete inventory of Garmin GPS receivers, the $99.00 National Geographic TOPO program with all the USGS topo maps in Oregon, our recommended Suunto M3 Compasses and other good map tools. Learn and employ skills and gear for safe bivy to base camp fun in deep snow near parked cars and privies! This basic to advanced training can be completed in this interesting FREE overnight seminar. Handouts will include a printed summary of the class information. This is a FREE outdoor, hands-on, interactive skills Seminar lead by Robert Speik and perhaps, mystery guest experts. Reserve your places! We are limiting this class to "11 or so" participants! *** In fairness to all, you will need to commit by January 11, 2006. For more information and to join this free Seminar: email info@traditionalmountaineering.org or call Robert Speik at 541-385-0445. See the flyer! See the Prospectus! This Seminar was full, with more than 20 Reserved! See our photos of this Seminar! .Backcountry expert Robert Speik presents “Staying Found in the Backcountry with Map and Compass," 10 a.m. to 12 p.m. and "Using a GPS to Find Your Way," 1 p.m. to 3 p.m. Members: $20 per class; non-members, $25 per class. *Pre-registration required by calling the Museum at (541) 382-4754, Ext. 500. Sold out with 45 attending the two classes! The two programs are designed to cover essentially the same information, but with different in-depth emphasis. A person can take one or the other, or both classes, depending on their interests. We will discuss Geocaching primarily in the afternoon class. There is a need for knowledge about GPS receivers in Bend at this time - local stores have sold many very expensive GPS models. These classes will get folks started in Staying Found with map, compass and GPS and in using their new skills for Geocaching and other backcountry adventures. More reservation information. See the High Desert Museum in the summer. See the Flyer for this event!. Thanks to The Bulletin, The Source Weekly and Z21 for featuring these two classes! Saturday, February 25, 2006, 9AM to 3PM, FREE Navigation Noodle® in the Badlands, no matter what the weather! Saturday, April 22, 2006, 9AM to about 3PM, Traditional Class on Glacier Travel and Climbing Steep Snow Slopes. 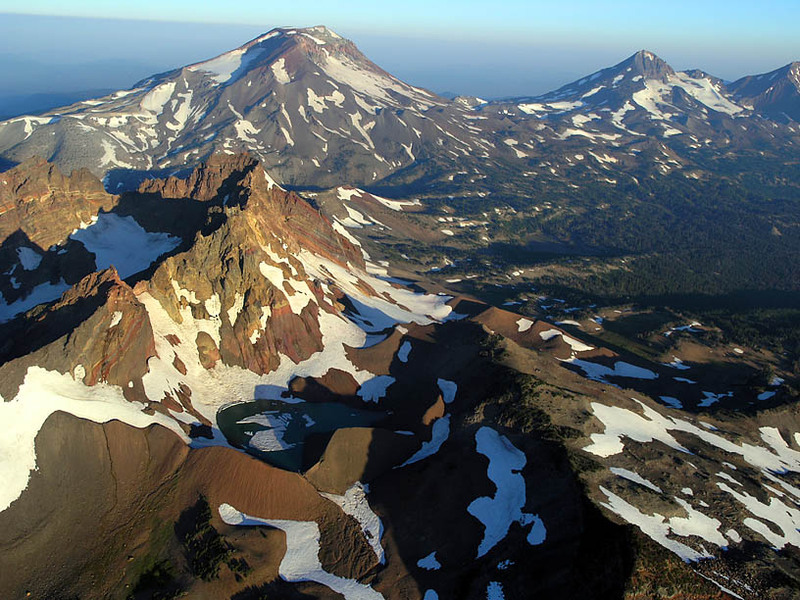 We will borrow the offices of Mountain Link, LLC, to learn and discuss skills and gear for rope protected climbing and rappelling steep snow, rock and ice on major local peaks, crevasse rescue gear and techniques and light and fast overnight gear for Shasta, Adams, Jefferson, North Sister and more. We will learn traditional Sarene snow anchors, upper belays, leader belays on steep snow, instant body belays, ice axe belays, roped travel, climbing fixed lines, rappelling, crevasse rescue, ice axe self belays, self arrest techniques and more including light and fast overnight snow bivys and recognition of hypothermia and frost bite dangers. No drop-ins please! Reservations only; pre-registered by April 19, 2005. Participate in a FREE Seminar on Basic Rappelling at the crags overlooking the Deschutes River at Meadow Trail Head near Bend, Oregon. Read the Prospectus. You must Reserve in advance! Email Basic Rappelling or call Bob Speik at 541-385-0445. 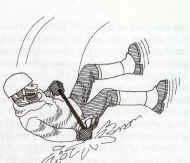 From Climbing Ice, Duane Raleigh, 1995, Illustration by Mike Clelland. We will use modern alternatives to this method. We will borrow the front porch of the Environmental Center in downtown Bend, to learn and discuss skills and gear for informed backcountry adventures in the high country. This class is based on traditional Basic Mountaineering Training provided by major outdoor clubs in the North West. Participants will learn more: 1. About the Basic Responsibilities of the wilderness traveler, traditional high country Leader and Follower ethics, the new Essential Systems and clothing, 3. 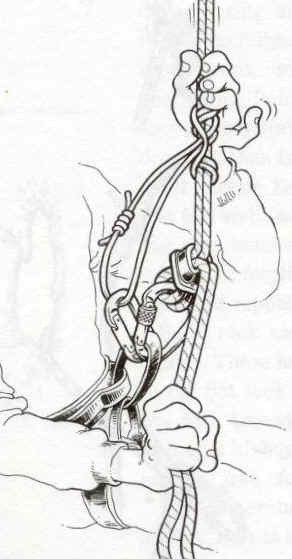 About the identification and possible mitigation of Risks in outdoor high country adventures using traditional rope protection techniques, 3. About planning a reasonable adventure and finding your way with map, compass and optional GPS and 4. About light weight high country camping, food and water management. No drop-ins please! Reservations only; pre-registered by August 1, 2006. Read the Flyer. Email info@TraditionalMountaineering.org. Call Bob Speik at 541-385-0445 anytime I am not outside. Students will learn about 1. Topographic and other maps used with the compass and GPS, their topo contours, scales, and UTM location grids, 2. About inexpensive modern base plate compass/protractors required with maps and GPS receivers, their important Central Oregon magnetic declination correction, compass and GPS bearings to define desired directions of travel and use them on the ground, and 3. About inexpensive hand held GPS receivers, their usefulness, accuracy, required basic individual setup changes, important features and simplified use in the field. Students will learn how to use the GPS receiver with map and compass, tips and time savers, and how to minimize navigation errors caused by the effects of bad weather, darkness, fatigue and stress on the navigator. Hands-on training for individual current GPS models includes: The required setup changes to GPS factory defaults that are necessary for the most basic use; simplifying the marking/saving/creating, finding of landmarks/waypoints in UTM position coordinates; setting up the inexpensive hand held baseplate compass to eliminate the large 17 degree Central Oregon magnetic declination error; using a simple route back to camp or truck; finding topographic maps and other maps of types used with the GPS; using the map, compass and GPS together for planning and in the backcountry; area familiarization and planning before the trip. We will practice all these skills at the Environmental Center classroom. Cost per student is a $35.00 donation benefiting the not for profit website www.TraditionalMountaineeing.org. Handouts include an eleven page printed summary and a five page workbook. Use your compass and GPS or try ours. Sold out with 22 attending! See the photos! In fairness to all, you must Reserve a place! Register by August 15, 2006. See the Flyer and/or Print the flyer for a friend! For more information email info@traditionalmountaineering.org or call Robert Speik at 541.385.0445. Staying Found in the Backcountry: with Map, Compass and GPS, Together! This is a free class; Reservations are requested! There are 89 seats. In fairness to all, you must Reserve a place! For more information check with your Snowmobile Club, Workensport, the website, email info@traditionalmountaineering.org or call Robert Speik at 541-385-0445. Print the Flyer for a friend! Filled with 89 Reserved and a "wait list" of over 50. Watch for a FREE repeat Class in January 2007! Saturday, February 12, 2005, 9AM to 3PM, FREE Navigation Noodle® in the Badlands, no matter what the weather! We plan to meet at near the Mt. Bachelor parking lot at about 9AM. From there we will hike on consolidated snow or snowshoe to certain appropriate slopes for steep snow climbing skills and ice axe belay/arrest practice, skills needed for Aconcagua, Hood, Shasta, Jefferson, Adams, and all the others. Learn about skills and gear for rope protected climbing and rappelling steep snow, rock and ice slopes on major peaks, avalanche risk avoidance, crevasse rescue gear and set-up See the Prospectus. See the Photos of previous seminars. Read more on Robert Link and Associates. Information from Robert Speik at 541-385-0445, info@traditionalmountaineering.org No drop-ins please! Reservations only; pre-registered by March 9, 2005. FULL at 30 people (read - 3 groups of 10) Reserved! An indoor, hands-on, interactive gear and skills class with Robert Speik and mystery guest experts: Skills and gear for rope protected climbing and rappelling steep snow, rock and ice slopes on major peaks, avalanche risk avoidance, crevasse rescue gear and set-up and light and fast overnight gear for Shasta, Adams, Jefferson and more. Meet new friends from 9:00 a.m. to 3:00 p.m. at The Environmental Center 15 Kansas St.
Reservations $35, ($45 for couples). Reservations Required; ten participants maximum. Note: Twenty folks attended in 2004. 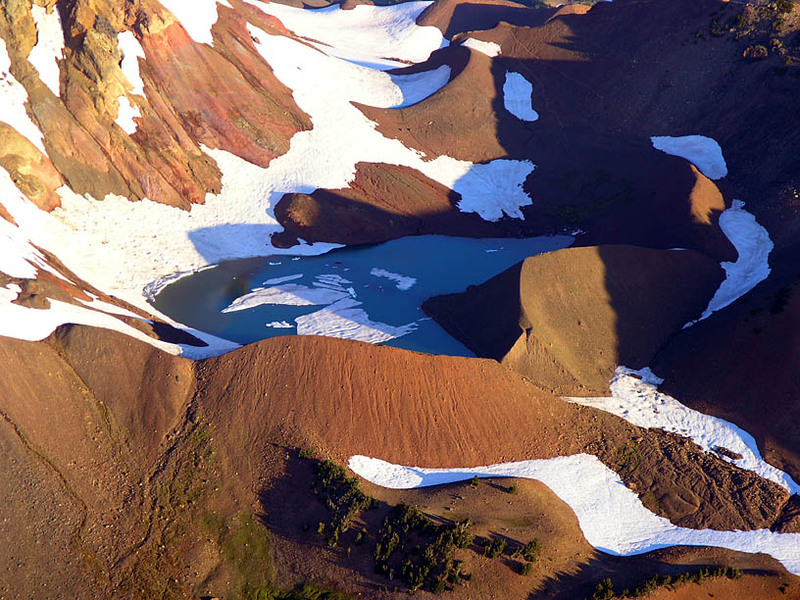 South, Middle, the sinister North Sister, and Broken Top from Mt. Bachelor. Photo Copyright© 2005 - 2009 by Robert Speik. All Rights Reserved. Membership in the Sierra Club is NOT required. Free and open to the public including snacks and beverages and the 7:00PM program. Saturday, January 17, 2004, 9AM to about 3PM, "Navigation Noodle in the Badlands®", no matter the weather! This is a FREE field exercise for folks who attend the Sierra club social noted above. For photos of a previous Noodle go to http://www.traditionalmountaineering.org/Photos_Badlands_Noodle_sm.htm. Jim Witty wrote up a Noodle in the Bulletin: http://www.traditionalmountaineering.org/News_Noodle.htm. A detailed Prospectus will be available at the Sierra Club meeting. Oregon Department of Fish and Wildlife sponsors summer and winter workshops for outdoor gals. Sessions include skiing, snowshoeing, Dutch oven cooking, bow-hunting, winter survival, photography, etc. and of course, map, compass and GPS. We will meet at the Mt. Bachelor parking lot conduct the training at the 40 foot half crevasse. See the Photos of a recent seminar. Read the Prospectus. Information from Bob Speik at 541-385-0445, info@traditionalmountaineering.org Subscribers only; pre-registered by March 5, 2004. Bring your gps and compass to GI Joes and ask Bob about Land Navigation, Geocaching, and advanced hiking and mountaineering. Free discount vouchers! You can ask questions and sign up for the Class on Wednesday, April 7, 2004 at the Environmental Center in Bend (see below). Responding to popular demand, Bob Speik has agreed to schedule his Backcountry Navigation Seminar for hikers, climbers, Geocachers, explorers and rescuers. The Seminar covers basic to advanced map, compass, GPS and altimeter use in the field. Click here for the Prospectus. Cost is a $30.00 donation to TraditionalMountaineering. To Register, email Bob Speik or call him at 385-0445. You must pre-register for these seminars. We will meet at the Mt. Bachelor parking lot conduct the training at the 40 foot half crevasse. See the Photos of this training. Read the Prospectus. Information from Bob Speik at 541-385-0445, info@traditionalmountaineering.org Subscribers only; pre-registered by April 16, 2004. No drop-ins please! We will travel about eleven miles cross country over glacial moraines and the Bend glacier and on trails around this spectacular peak. We will travel at a social pace with time for views and photographs. Light crampons and ice axe required for the steep hard snow glacier slopes. Qualified Subscribers only. Contact Bob Speik for Prospectus and a Reservation. See photos of this adventure. We will pack in form Pole Creek on Saturday afternoon, climb the peak on Sunday and pack out or stay over to enjoy the evening and pack out on Monday. We will travel at a social pace with time for views and photographs. Light and fast overnight gear required. Qualified Subscribers only. Contact Bob Speik for Prospectus and a Reservation. Weather dependant. See photos of last years climb. Rescheduled due to snow! We will travel about twenty miles cross country on steep climber's ways, over glacial moraines and the Prouty glacier and on beautiful trails around this spectacular peak. We will travel at a social pace with time for views and photographs. Light and fast overnight gear required. Qualified Subscribers only. Contact Bob Speik for Prospectus and a Reservation. Weather dependant. See the photos of our adventure. This classs is similar to winter basic mountaineering training provided by many major mountaineering clubs in the United States. Saturday, December 4, 2004, 9AM to 3PM, FREE Navigation Noodle® in the Badlands, no matter what the weather! This is a FREE field exercise for folks who have learned a bit about modern land navigation techniques with map, compass and "optional" GPS. For photos of a previous Noodle go to http://www.traditionalmountaineering.org/Photos_Badlands_Noodle_sm.htm. Jim Witty wrote about a Noodle for The Bulletin: http://www.traditionalmountaineering.org/News_Noodle.htm. Limited to 11 people. You must Reserve a place! Call Bob Speik at 385-0445 for the meeting place and a detailed Prospectus. The Oregon Natural Desert Association, (ONDA) founding member of the Central Oregon Environmental Center, has been working for many years to make The Badlands east of Bend a lawfully designated Wilderness Area. The many square miles of often trackless natural desert terrain are a wonderful place to wander and explore off the beaten path. This backcountry navigation seminar is designed to unlock this wilderness for off trail hiking, exploration and inspiration. The outing is FREE and open to all, but limited to 11 folks who have reserved in advance. For more information, a Prospectus, or to Register, contact Laurel at lhickok@onda.org or 330-2638. See the photos. FULL, register for February, see below. Join us for this map, compass and gps game in Shevlin Park just west of Bend. Geocaching is a world-wide phenomena: a free outdoor activity that hones your navigation skills on an internet based treasure hunt. Go to Geocaching now, put in your zip code and find out what's happening! Call Groundspeak Charter Member Bob Speik to find out more about this free low key Geocaching hunt. Call Bob at 385-0445 for the details of this adventure. See the January 22 write-up above. We might form a regular Wednesday Geocaching adventure group. Call Bob at 385-0445 for the details of this adventure. Bob Speik's basic to advanced map, compass, GPS and altimeter classroom instruction. For more information and a reservation, call Denis Wood at 593-7477. The Oregon Natural Desert Association, (ONDA) founding member of the Central Oregon Environmental Center, has been working for many years to make The Badlands east of Bend a lawfully designated Wilderness Area. This 32,221 acre parcel of often trackless natural desert terrain is a wonderful place to wander and explore off the beaten path. This backcountry navigation seminar is designed to unlock this wilderness for off trail hiking, exploration and inspiration. We will learn about the practical use of map, compass and GPS in this Navigation Noodle in the Badlands. This will entail walking as a group, working in pairs or threes to solve practical navigation problems presented by the unique terrain of the Badlands area. We may walk as much as six miles over the course of the day over desert sand and jeep trails. Please bring: hiking boots or shoes, lunch, 2 quarts of water, dress for the forecast weather, rain-gear, compass and optional GPS. It is strongly recommended that you either purchase or borrow the USGS Horse Ridge topo map for the navigational exercises. See the photos of the January Noodle. The outing is FREE and open to all, but limited to 10 folks who have reserved in advance. Sorry, no dogs please. For more information, read the Prospectus, or to Register, email Laurel Hickok or call 330-2638. 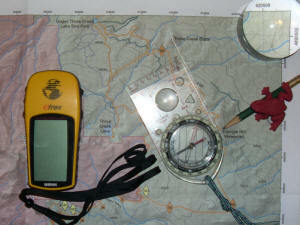 Join us for this map, compass and gps game in the high desert east of Bend. Geocaching is a world-wide phenomena: a free outdoor activity that hones your navigation skills on an internet based treasure hunt. Go to Geocaching now, put in your zip code and find out what's happening! Call Bob Speik (91 found, 14 hidden) to find out more about this free low key Geocaching hunt. Call Bob at 385-0445 for the details of this adventure. We will camp near the rigs (and the toilet) at Virginia Meissner snow park. Try out your new winter bag and bivy, your big four season tent or build a snow cave. Read more. We will cook and have fun as a group. Saturday pack up and do what you want: snowshoe, crampon, ski, etc. More information and a Prospectus, soon. The Oregon Natural Desert Association, (ONDA) founding member of the Central Oregon Environmental Center, has been working for many years to make The Badlands east of Bend a lawfully designated Wilderness Area. This 32,221 acre parcel of oftenkless natural desert terrain is a wonderful place to wander and explore off the beaten path. This backcountry navigation seminar is designed to unlock this wilderness for off trail hiking, exploration and inspiration. See the photos of the January Noodle. The outing is FREE and open to all, but limited to 10 folks who have reserved in advance. For more information, read the recent Prospectus, or to Register, email Noodle or call Tommie at 385-0445. This 6 hour technical clinic is offered by member Bob Speik who has personally taught over 200 people and supervised the training of 2,000 more while serving as a Leader and Chair of the Sierra Club’s Los Angeles Mountaineering Training Committee. Recently, he has instructed arrest training at COCC. 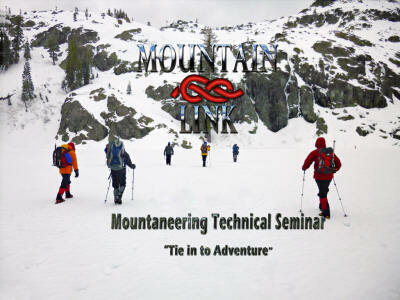 Details of the seminar can be studied at www.TraditionalMountaineering.org. Responding to popular demand, Bob Speik has agreed to schedule his Backcountry Navigation Seminar for hikers, climbers, Geocachers, explorers and rescuers. The Seminar covers basic to advanced map, compass, GPS and altimeter use in the field. Click here for the Prospectus. Cost is a $30.00 donation to TraditionalMountaineering. To Register, email Bob Speik or call him at 385-0445. The Oregon Natural Desert Association, (ONDA) founding member of the Central Oregon Environmental Center, has been working for many years to make The Badlands east of Bend a lawfully designated Wilderness Area. This 32,221 acre parcel of often trackless natural desert terrain is a wonderful place to wander and explore off the beaten path. This backcountry navigation seminar is designed to unlock this wilderness for off trail hiking, exploration and inspiration. See the photos of the January Noodle. The outing is FREE and open to all, but limited to 10 folks who have reserved in advance. For more information, read the recent Prospectus, or to Register, email Noodle or call Tommie at 385-0445. Bob Speik's basic to advanced map, compass, GPS and altimeter classroom instruction. For more information and a reservation, call Al Meilink at 593-5183. 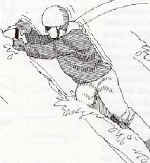 Learn and practice ice axe arrest skills with TraditionalMountaineering! Read more Ice axe arrest photos in 2004. 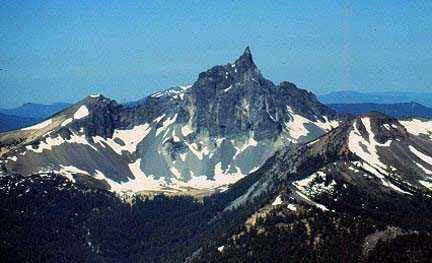 Exploratory technical climb of Thielson, the "Lightening Rod of the Cascades". Subscribers only. See photos. Use the basic skills needed to go off trail in the backcountry. A free field experience for folks who have studied the map, compass and optional GPS skills of the Wilderness navigator and for those who would like to learn more about these skills. This instructional seminar is not an orienteering outing. This is the sixth year for this popular clinic! See last years Photos . For the write up click on a recent Prospectus. For The Bulletin's news coverage click Noodle. For information call leader Bob Speik at 385-0554 or email Noodle. Photo Copyright© 2004-2014 by Robert Speik. All Rights Reserved.